CENTRAL CITY - Naomi Revlett Brewer, 89, of Central City, died Monday, November 28, 2016, at 10:05PM at Owensboro Center. Mrs. Brewer was born May 18, 1927, on the family farm in Ennis, KY to James M. and Gertrude Reid Revlett. She was a homemaker and member of New Paradise Baptist Church. As a child, her family grew strawberries and packed them to ship to Louisville by train to be sold as a cash crop. She loved to read, quilt, vacation at the beach, and spend time with her family and grandchildren. She traveled to Israel. 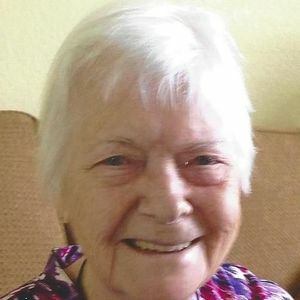 She had fond memories of two special dogs: Bulger, a small bulldog, and Bounce, a collie. She was preceded in death by her husband, William David "W.D." Brewer; parents James Mitchell and Gertrude Revlett; brothers James Revlett, Clyde Revlett, Phillip Revlett, and Billy Revlett; and sisters Ada McPherson, Wanda Revlett, and Louise Fisher. She is survived by her daughters, Linda (Charles) Brewer Jensen of Florida and Susan (Gary) Brewer Johnson of Belton; son Joel D. (Diane) Brewer of Owensboro; grandchildren Jonathon Jensen, Joseph Jensen, Regina Martin, Valerie Ward, Andrea Robertson, and Michael Johnson; and nine great-grandchildren. Funeral services will be Thursday, December 1, 2016, at 2:00PM at Tucker Funeral Home in Central City, with Bro. Eddie Duke officiating. Burial in Ebenezer Cemetery. Visitation will be Wednesday after 5:00PM at the funeral home. Online condolences may be made at www.tuckerfuneralhomes.com. The beautiful and interactive Eternal Tribute tells Naomi's life story the way it deserves to be told in words, pictures and video. Prayers to all the family. No words can ease the pain and loss that you each feel right now. Let your heart rest knowing Naomi is now at rest with WD. Love to all. Lin, Joel and Susan, it is with a heavy heart that I cannot be there with you. I have many fond, loving memories of Aunt Naomi such as when one of us were disciplined we all were regardless whose started the fracas right on through until Aunt Naomi was the only one who was able to bring me peace and comfort when my own mother passed away. I will carry her in my heart with my mother and all those who have gone on before. She was a special lady and you were so very lucky to have had her in your lives for such a long time. I love you all!!!!!! My deepest condolences for the loss of Your Mother, Joel, May her memories forever be sweet to You All. I have been praying for you all. I have been praying for your comfort during this time. Naomi seemed to be an incredible Mom and person. I know the memories you have of her will be a treasure that you will cherish. I love you all. Joel, Diane, and family we are prayig for you all at this time. God will lift you up and shelter you in His mighty arms. May God bless you all! We are praying for you all! My sincere condolences to Cousins Lin, Joel and Susan and the rest of our family, on the passing of our dear Aunt Naomi. I know that the past few days have been very painful for you, but I am glad that she was surrounded by your loving, caring presence. Now is the time to be together and support one another as we remember her joyful life. My best memory was the last time I got to visit with Aunt Naomi in July 2011. I was on a road trip returning from Nashville, Tennessee. I called her from the road and was lucky to find her at home. We had a wonderful visit in Greenville, went out shopping, and came back and had lunch together--just the two of us. She shared her photo album and gave me updates on all of her grandkids, and she was so proud of every one of them! I need to look back through my photos and see if I took a picture of her that day. I am saddened to read of the passing of Naomi. She was a wonderful kind Christian Woman. I am blessed to have known her. I smile when I recall the times she had with Mother when they were Neighbors. I know they both enjoyed each others Friendship so much. I am so very sorry for your loss. I pray that you find comfort and peace in you many precious memories of Naomi. I am so sorry that I cannot come to the visitation or Funeral. I have an MRI in Nashville tomorrow afternoon and a Doctors Appointment in Owensboro on Thursday. I will keep you all in my thoughts and prayers.